What is the best type of financing for a new business venture? While there is no simple answer, a free, powerful new eBook from MoreBusiness provides insight, education and practical evaluation tools to help entrepreneurs finance their business - the right way. With this eBook, entrepreneurs are more prepared to make critical decisions about their ventures, with an ability to present to investors and financiers more confidently and competently. You can't afford to go into business without this eBook. MoreBusiness.com is providing answers to burning questions that small business owners and aspiring entrepreneurs seek. There is more than one way to finance a business, and every startup venture requires a different approach. 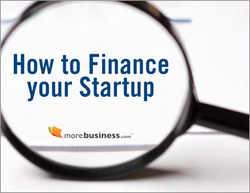 MoreBusiness.com's free eBook, titled How to Finance Your Startup, explains the options, providing entrepreneurs with practical evaluation tools to help them weigh the pros and cons. Readers can expect to learn about many different financing options for businesses, including personal financing, business lines of credit, SBA loans and venture capital. Entrepreneurs can even take advantage of creative financing options that are often overlooked by individuals in the business world. This free eBook also is packed with practical examples of success stories from real business owners who have used all of these different financing options to launch a successful venture. How to Finance Your Startup isn't an ordinary financing guide. This eBook features worksheets that evaluate your potential for success with various financing options. The worksheets are fast and simple to complete, and by the time people finish the eBook, they should have a clear understanding of the specific and viable options they can use to finance their business. "This is a valuable resource that will truly help you understand how to finance your business, no matter what industry you are entering," says CEO Raj Khera. "With this eBook, entrepreneurs are more prepared to make critical decisions about their ventures, with an ability to present to investors and financiers more confidently and competently. You can't afford to go into business without this eBook." About MoreBusiness.com: MoreBusiness.com is an award-winning website filled with sample business plans, marketing plans, templates, sample contracts and business agreements to help entrepreneurs start and grow a small business. It is part of a series of sites run by Khera Communications Inc., which includes email marketing service, MailerMailer, and discussion group management tool, DiscussThis.